Lazies, Meet Hang On, our newest Girl. She’s a helping hand, or pocket, to hang where needed. I especially love her for housing my cell phone, or holding the keys at the door. 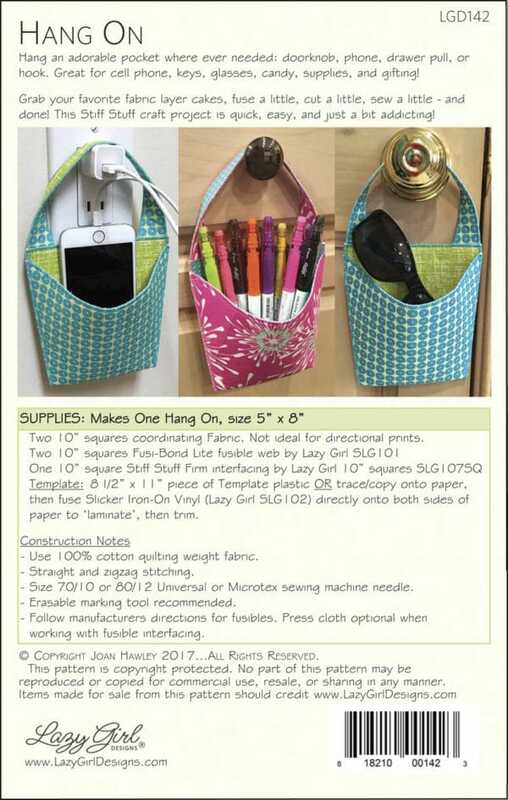 Hang On is another Stiff Stuff craft pattern, made from a 10″ square. She is quick as can be so get ready to make a ton. Read on for details and to find out when the pattern will be here. Look at all those great curves! Hang On has a flat back so she hangs nicely against the wall or door. – One project from one 10″ ‘sandwich’ composed of fabric, Fusi-Bond Lite and Stiff Stuff. – Meet the original Stiff Stuff craft patterns here. I’m not sure it could be any quicker! 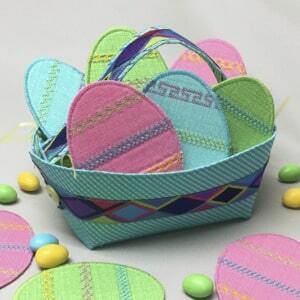 Cut two pieces, stitch, fold, and fun! Then fill with necessities, like chocolate and hang close by. She’s bowed at the front for extra roominess. And the handle is like a hat trick – it bows forward, too. This simple engineering means the handle hangs directly over the pocket. 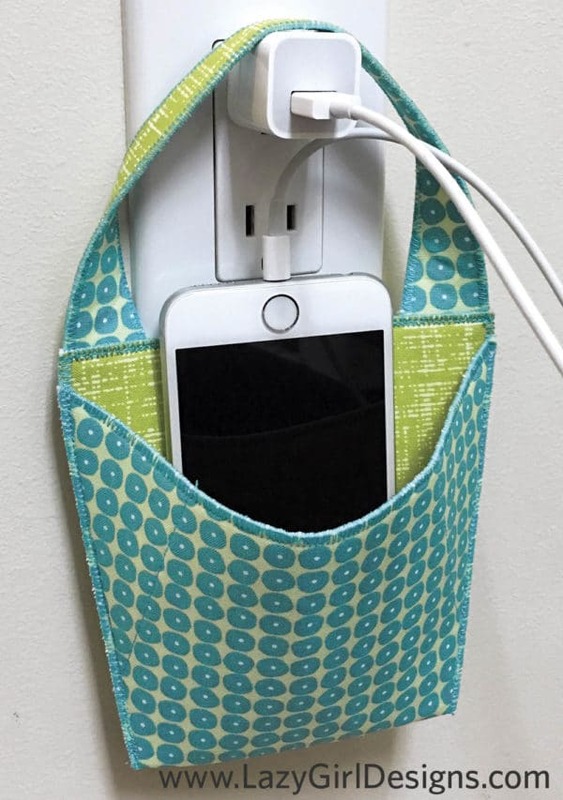 Hang On a hook by your phone charger and wrangle those cords! 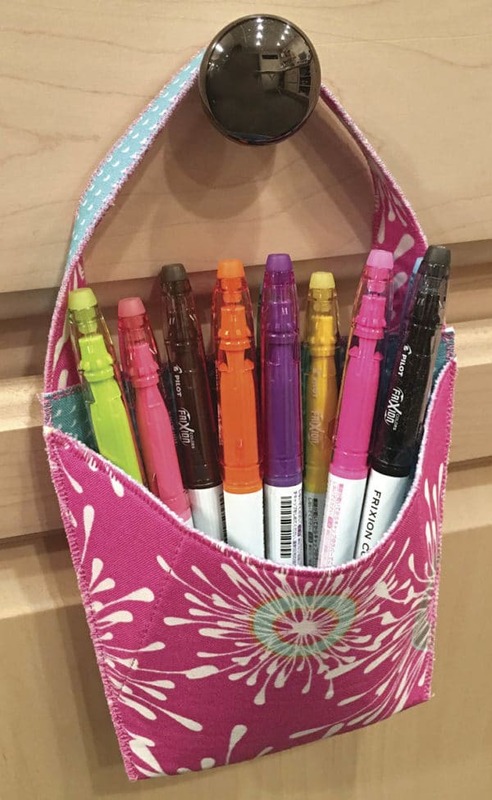 Organize supplies in the office or sewing room. Where are those sunglasses and keys? Construction is easy. 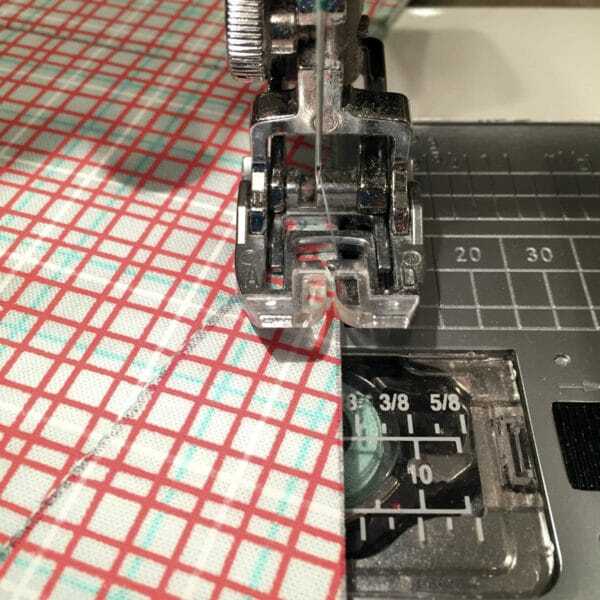 Just zigzag the edges and make a few seams. The project folds at the bottom, so directional prints may be a challenge on this design. You’ll need our Stiff Stuff and Fusi-Bond Lite for this project. 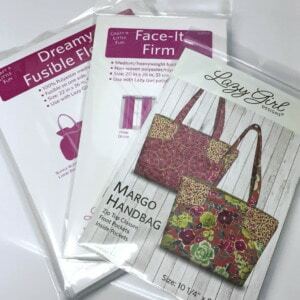 The unique properties of Stiff Stuff from my Lazy Girl Interfacing line brings these designs to life. Stiff Stuff is like the perfect hybrid between stiff/crunchy/thick interfacings and foam. Stiff Stuff has structure, but is forgiving, lightweight and thin. 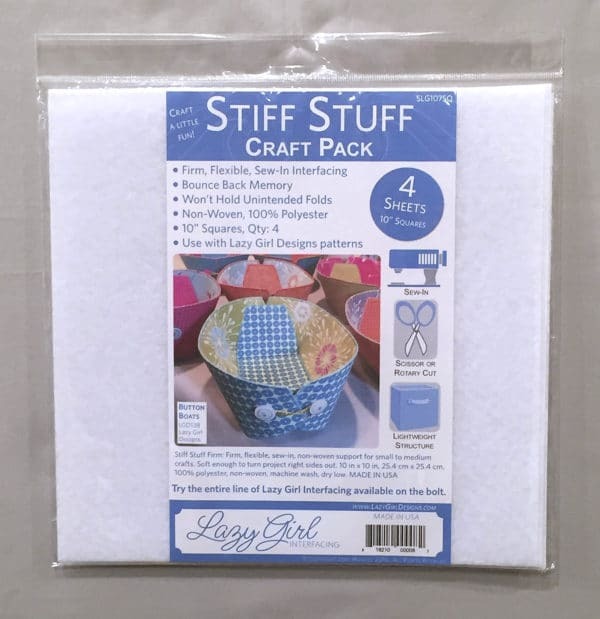 Try our Stiff Stuff Craft Pack, item SLG107SQ. Each pack includes four 10″ squares. Also available on a 10yd (SLG107) or 20yd (SLG10720) bolt. The pattern includes templates. Check out my handy tutorial for laminating your own paper templates. 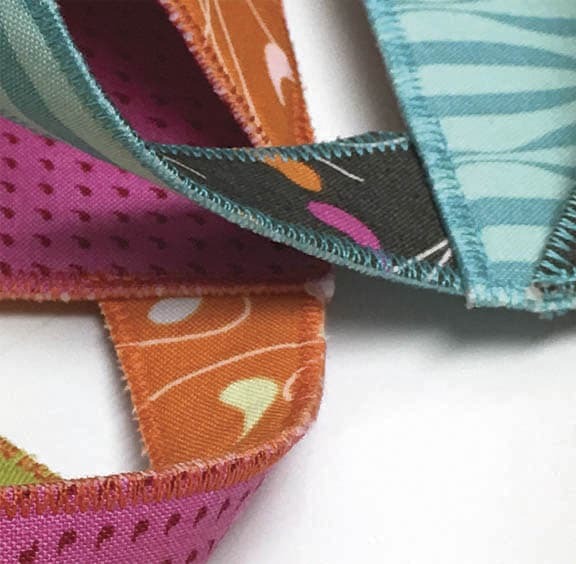 Find Hang On this week at Quilt Market at Checker, Brewer, United Notions, and E. E. Schenck. Order directly through me or your fav distributor. These distributors, plus Quilt Source, carry our entire line of interfacing. Are you already stitching in your mind? I am! Yum, look at those colors! 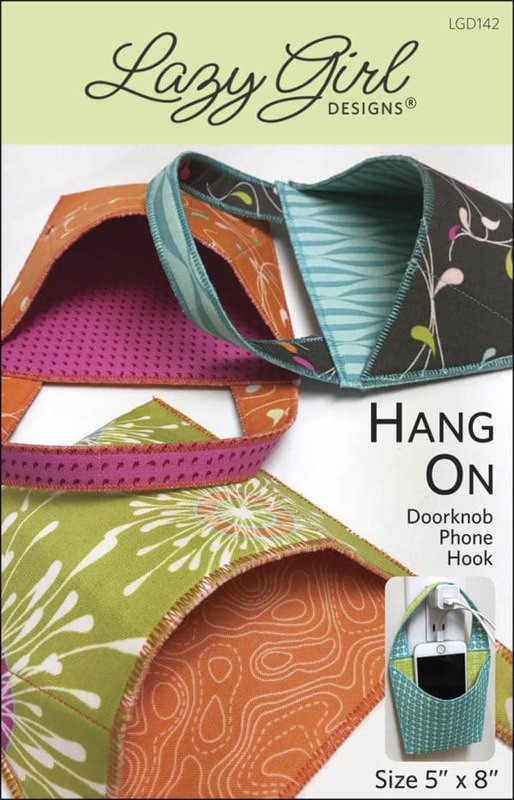 Hang On is available in our pattern store here. What do you think? 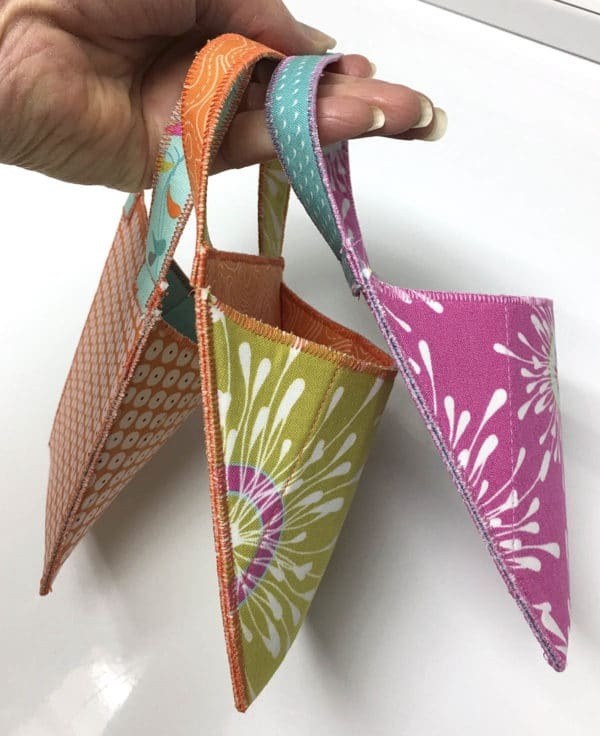 Are you ready for more crafty, fusi, stitchy fun? 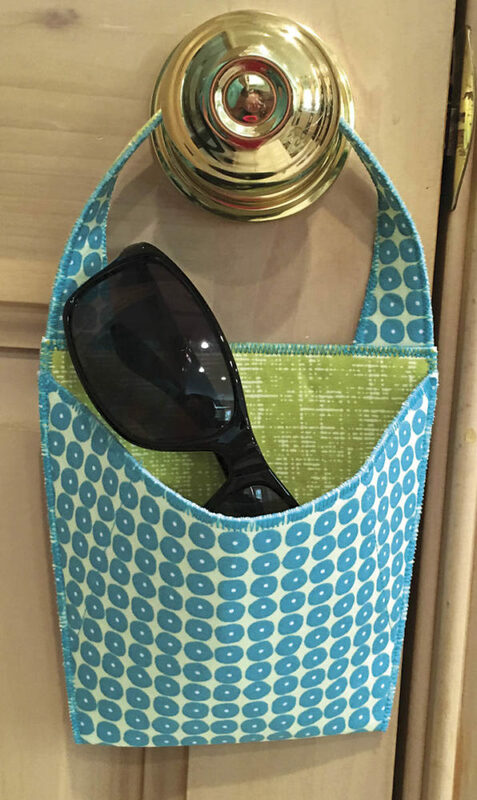 Joan, these Hang On bags are brilliant! I have lots of 10″ squares, now just have to figure out where to buy this! I have your fobio pattern. Where can I get more hardware to make more fobios? They are super cute. 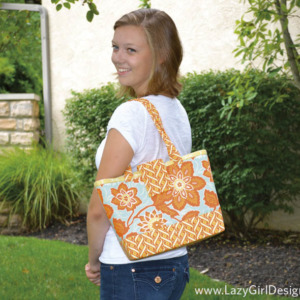 Hi Liz, Try Zipit on Etsy – they have the hardware in stock!